VIENNA, Austria, June 20, 2011 (ENS) – Random unannounced inspections of nuclear plants in International Atomic Energy Agency member countries would strengthen global nuclear safety, the IAEA’s top official proposed today. The UN agency called a meeting of ministers to identify the lessons learned from the accident at Japan’s Fukushima Daiichi power plant that has spread radiation across Asia and the Pacific. Caused by the March 11 earthquake and tsunami that cut power to the plant’s cooling systems, the ongoing crisis has been rated Level 7 on the International Nuclear Event Scale, equivalent to the Chernobyl accident. In many countries, the Fukushima Daiichi accident has shaken public confidence in the safety of nuclear power plants. 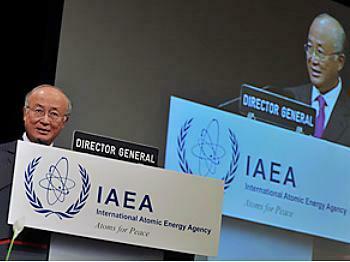 IAEA Director General Yukiya Amano told ministers that the agency should play a central role in ensuring the safety of nuclear power around the world. In the past the IAEA has conducted inspections of nuclear weapons facilities, but has never conducted regular inspections of the world’s hundreds of nuclear power plants. 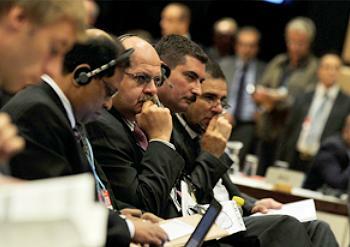 Amano also proposed that the agency establish a regional emergency response framework. “Regulators must be genuinely independent, adequately funded, and staffed by well-trained personnel,” he said. Japan’s Industry Minister Banri Kaieda briefed the conference on developments at the Fukushima Daiichi plant, where the nuclear fuel in at least three of the reactors has melted down, releasing radiation. Kaieda told the ministers that the Japanese government intends to maintain its nuclear energy policy on condition that the safety of Japanese power plants is guaranteed. Kaieda said at a news conference Friday in Japan that the instructions issued by the Nuclear and Industrial Safety Agency to Japanese electric power companies covering emergency safety measures for nuclear power plants based on the lessons learned from the Fukushima Daiichi accident had been implemented appropriately. 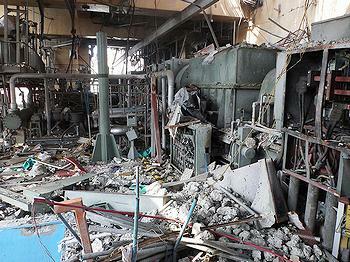 On June 15 and 16, NISA officials visited the power plants and concluded that appropriate short-term measures had been taken, such as confirming the procedures to be taken to release hydrogen gas from reactor buildings to prevent a hydrogen explosions such as the three that blasted open reactor buildings at the Fukushima Daiichi nuclear plant. Caught between safety and power shortage concerns, Kaieda urged local governments to allow the restart of nuclear power plants that have stopped operations due to inspections. If resumption of operations is delayed, electricity shortages are expected this summer when demand peaks. In Vienna later today, the ministers are expected to issue a declaration calling for an assessment of nuclear regulators and nuclear plants in IAEA member states. The declaration will call for an international framework to quickly respond to nuclear plant accidents and other emergencies.